My Great Grandfather, Archibald Gracie Ogden, played semi-pro baseball in Elizabeth, NJ in the late 1800s. His Great-Great Grandfather, Colonel Elias Dayton of the 3rd New Jersey Continentals (1st establishment), may have played a form of protobaseball more than 100 years before, along with his regimental chaplain, various officers, and even some of their Iroquois allies. Vol III of the Proceedings of the New Jersey Historical Society (1848-1849) includes the Journal of Lieutenant Ebenezer Elmer of the 3rd NJ Regiment,in which he makes mention of a game called Whirl played while on garrision duty in September, 1776. [September 16th, 1776] "...we had a long play at whirl with the Colonel and Mr. Kirtland, (who exercises among us with the greatest familiarity), some of the Indians, and such of the officers as saw fit: continued at it for a very considerable period of time. After which I went with some others and took a drink of grog..."
[September 18th, 1776] "...in the afternoon the Colonel, Parsons, and a number of us played whirl." [September 20th, 1776 a.m.] "...we had a game or two more at whirl; at which Dr. Dunham gave me a severe blow on my mouth which cut my lip, and came near dislocating my under jaw..."
[September 20th, 1776 p.m.] "Played ball again." Lt. Elmer makes mention of playing ball in October of that year, and again in 1777 in New Jersey when the Regiment had returned from the New York Frontier. Some researchers into the origins of baseball have inferred from the two entries on September 20th that "Played ball again" is in reference to the previous game of Whirl, although no one knows anything more about the game, its origins, or how it was played. An article by Bonnie S. Ledbetter entitled "Sports and Games of the American Revolution", published in the Journal of Sports History, Vol. 6 No. 3 (Winter 1979), proposes that Whirl may have been a game of Elmer and his associates own invention to while away their unaccustomed leisure time at Fort Schuyler, as his is the only known reference to a game by that name. If so, it may not have been very complicated to learn, as Mr. Kirtland the parson had only recently joined the regiment to replace Reverend Caldwell, yet seems to have joined in with great gusto. I tend to think that whatever game it was would have been very similar to other games more familiar to participants, especially if they were able to field a team that included their native american allies. In any case, I find it quite fitting that a game which might have been a forerunner of our National Pastime was played during the Revolution by my ancestor Elias Dayton in upstate New York. It gives a little weight to Cooperstown, after all, even if old Abner Doubleday's claim is no longer taken as Gospel. My parents celebrate their 44th wedding anniversary today, somewhere way back of beyond up the Amazon. Those of you who know them will appreciate that this is probably the last place you would expect them to be spending this time together, if the past is anything to go by. But retirement suits them and the adventurous spirit of my Mom has enticed my Dad to venture beyond his usual zone of comfort. I hope they are making marvelous discoveries moment by moment and are surrounded by new birds they will love to see. I am about to go into a 2 hour meeting, then drive home on a gorgeous day to change my children's lives with a conversation that has been bumped up a few days from when I expected. There is no best time to tell two little people who are dearer than life to me that their parents are planning to divorce. I actually think I will do it with great compassion and sensitivity, for it will be me introducing this topic to them and then both of us answering questions and offering comfort to our children. I will look them both in the eyes, with love, and tell them they are loved, and I will be in the moment, and up to the task. I will not let myself resent the brushback pitch, high and inside. That is what pitchers do. It is their nature. I understand the high heat. I can guard the plate. And I fouled off a few of them, but this is ball four, and this weekend I get to walk, and maybe even advance the runner. I leave at crack of dawn tomorrow for the Battle of Monmouth reenactment. I will then stay with people I love and return late on Sunday. What will have changed at home will be hard to tell on the surface. I will be a curious and engaged father to respond to what may stir beneath. I was never a good fielder, but I can read the signs. The youngest members of Red Sox Nation in our household are too young to remember the dry years. They have never seen their heroes as bums, or endured a second half of the season with the Sox slumping out of contention. These are their years of irrational exuberance. They came to the game when their Dad was still on the delirious crest of the 2004 Series and before the 2007 championship. 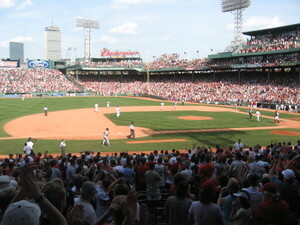 They saw their first giddy game at Fenway in June in great seats and the Sox won. The first time they saw the Old Town Team on the tube - in a Maine motel room on the way to a vacation without electricity on a magical island far out to sea - they formed emotional attachments to its marque players. Elias naturally went for Big Papi. Emily gave her heart unconditionally to Manny Ramirez. I haven't yet had the heart to tell her he's gone. Baseball teaches you to savor the rare moments of near perfection and to believe in miracles, all the while reminding you to get used to disappointment. The lessons of the grand cathedral of the grass come from Matthew 23:12. The homilies are all about hope and loss. Our communion of saints is reserved for those who have passed on to a better place, not fallen by the wayside. Where are Nomar, Pedro and Lowe? Joined another church. Where are Boggs, Clemens and Damon? Joined a rival sect. Change is certain. Give your heart and expect it to be broken. Risk love knowing it can't last. Some things endure. Emily fell for Manny at first sight. How could she not? He was not the silent leader, brilliant behind the plate but woeful beside it. He was not the fleet-footed infielder, that springbok in a herd of wildebeest. No, she loved the class clown, charismatic and cute in his baggy uniform and oh so free and easy. I knew with certainty what every father of a tender-hearted daughter learns; this love would end in heartbreak, and there was nothing I could do to spare her. Perhaps postpone it for a day, but no more. "Think back to when you were 16 and fell in “love” that first time and then all of the sudden she dumps you for the high school quarterback or the star running back. You were sad, maybe even upset that your one true love was gone and you’d never be able to go on in life. You can admit that because we’ve all been there before in our lives. Did you get over it? Sure you did but it took time. No matter if you loved her or hated her, you got over her and moved on to one of her friends probably (women can reverse the scenario to where he left you for the head cheerleader or one of the cheerleaders). The same applies here. You will get over the loss of Manny. Yes you were expecting him to be wearing a Red Sox uniform for the rest of his career and now are thinking that you’re going to have to change the name of your dog or cat because you loathe Manny. All normal reactions I tell you because you will get over it. If we sit here and lament over the loss of Manny, we aren’t going to be able to move on. Sure there’s going to be that grieving period where you pinch yourself just to make sure this wasn’t just all a bad dream. Believe me, I’m with you, I wish it was a bad dream too. I am even sure you might even sneak a peak at the Dodgers boxscore tonight just to see what Manny did. You might even have stopped by here earlier in the evening when we have posted what Manny has said in his press conference this afternoon at Dodger Stadium. No matter what you do, you will be fine." Will her love turn to loathing, her tender heart tenderized with a 33 oz bat? Will she carry a torch even as he wears the Dodger Blue? Or will she, with the wellsprings of an 8-year-old's empathy, somehow see through the casual clown to the tears within? 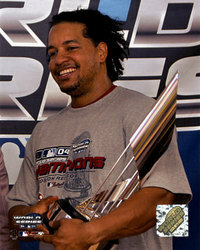 Today, at least, Manny Ramirez' Official Site has not yet moved on from the Sox. Will he, ten years from now in a middle-aged funk, look back on his glory days, twisting the school rings of '04 and '07, and remember lost love? I can tell her that this will pass, and share my own stories of Red Sox hope and heartbreak. 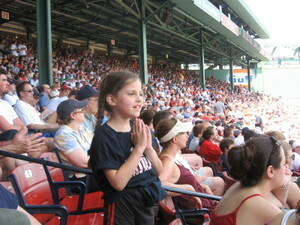 I can hope that she falls for that nice kid Pedroia, or wingfooted Ellsbury. None of that will matter. Her heart is her own. It will find its way. 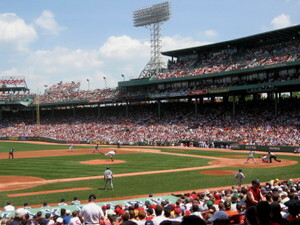 It was 95 degrees in the shade at Fenway this afternoon. I know because we were there. It was the kind of heat that can make Coors Light on tap at $7.25 a pop seem the acme of the brewer's art and cheap at twice the price. This was Emily and Elias' first major league baseball game, and mine in many years, so we braved the heat and cheered along with more than 37,000 fans as the Sox took the rubber match in its 3 game series with Seattle by the score of 2-1. Our seats were extraordiary, a gift from my father via a family friend who also happens to be both his Godson and a Red Sox VP. We were in the Loge Box behind the visitor's dugout and below the grandstand and in that 95 degree shade all afternoon which was a mercy as I cannot imagine how others endured the full sun. The game was certainly not a pitcher's duel, nor were there a surfeit of hits and runs, but those there were would suffice. J.D. Drew hit a solo shot in the 6th that put the Sox ahead (their first run was walked in by Seattle's Erik Bedard in the third). Bedard struggled through 5 innings with 99 pitches, while Justin Masterson pitched a strong six innings for the win and the bullpen saw it through in the last three innings with Hansen, Okajima and Papelbon. It was fun to try an imagine the experience of their first Red Sox game through my children's eyes and contrast it to my own at their age. There is certainly less organ music than I remember, and I'm sure John Kiley didn't play renditions of "Blister in the Sun" by the Violent Femmes, though it was appropriate for this scorcher of a day. That's a shame, because without the organ if feels slightly less like church though undoubtedly still a place of pilgrimage. The old ball yard looks well, with the occasional beach ball dancing above our heads but nary a whiff of grass that didn't belong on the field. Fenway today is smoke free and recycles. No one ran onto the field from the bleachers. 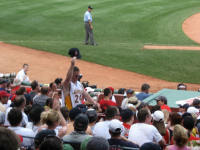 There was what might have turned into a lynching when it was discovered that someone was wearing a Kobe Bryant Lakers shirt in a sea of Celtics fans, but once he doffed his Red Sox Cap and flashed a peace sign the rising tumult was stilled and the game went on. We sang "Sweet Caroline" and cheered for Youk and Coco Crisp and the guy who said "Hey Ice Cream Heah!" I had that old thrill of walking up the aisle beneath the grandstand and out into all that color and sound and told Elias it was a magic door to a place of miracles. 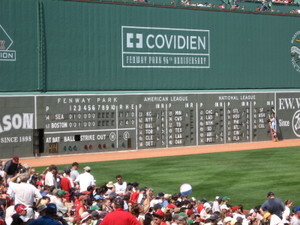 See if you can spot the error in the scoreboard on the Green Monster (click to enlarge). Hint: It is not the National League score being fixed manually by the person on the ladder. I wonder if anyone has tried to estimate how many dimples there are on the face of that wall? Or on the smiles of young fans? All in all, a memorable day at Fenway. Great Balls of Fire, or just Flaming Out? Note to self: "Never apologize for undisclosed mistakes in my life." It didn't work for Elliot Spitzer. It sounds just as grim coming from Roger Clemens. NEW YORK (AP) — Roger Clemens apologized Monday for unspecified mistakes in his personal life but denied having an affair with a 15-year-old. The Daily News reported last week Clemens had a decade-long relationship with country star Mindy McCready that began when she was 15 and an aspiring singer. The newspaper also linked the star pitcher to former Manhattan bartender Angela Moyer and Paulette Dean Daly, a former wife of champion golfer John Daly. "Even though these articles contain many false accusations and mistakes, I need to say that I have made mistakes in my personal life for which I am sorry," Clemens said in a statement issued by spokesman Patrick Dorton. "I have apologized to my family and apologize to my fans. Like everyone, I have flaws. I have sometimes made choices which have not been right." The apology was first reported by the Houston Chronicle. Clemens, his stock trading at an all-time low, does himself no favors with this vague admission of personal failings. Too bad he's not trying to get into the Rock and Roll Hall of Fame. Jerry Lee Lewis made it just fine in 1986, despite marrying his 13-year old cousin in 1957. It's official. I, as well as most everyone else in the temperate parts of the northern hemisphere, am trying to get a bead on spring. Pitchers and catchers have already flown to fields of green. Maybe it's the bluebirds and robins outside, and warm foggy days like today when the river swells and the foundation wall seeps. Or it could be that we have not been able to sustain enough clear cold days for pond skating that were not washed out soon after. At least this year, for the first time in three, the maple tree has remained dormant through a January thaw. I think of the sap buckets and the time, coming soon, when I will find another hand-span of trunk between the faded scars to place their spiles. I wonder if the river herring will return in hopeful numbers to Buzzards Bay, where their season has been closed for three years running. I think of spring peepers, and red wings, and the osprey following the fish up the coast. And it is still February, the traditional month of deep snows and deeper freezes here in the Litchfield Hills, the Berkshires and the high Taconics. When I was a boy - and this April I will be 40 so I get to say that - the last of the snow melted the week before my birthday. It is anyone's guess this year, or next, what the weather may bring. That is part of the package for us New Englanders. But if I am having difficulty attuning to the signs of the shifting season, what must it be like for those that truly depend on this ability? What range of variation do they sustain? For all its astonishing resilience, life on an ecotone is made of great swings and plunges. The edge frays between transitional and central hardwoods. The red-bellied woodpecker takes up permanent residence, and the cross bill retreats and is seldom seen. Somewhere in the pine woods, great horned owls are calling their mates. Soon, very soon now. Though I am an accumulator of all sorts of things, there's not much in the way of sports memorabilia in our house. There are two shoe boxes of baseball cards on a shelf in the attic collected in my 3rd and 8th grade years (1977 and 1982), some ticket stubs from Yankee and Red Sox games, but not much else. It's not like I have mustard packets from Ebbets Field, like one of my father's friends, or something signed by Ty Cobb like what Dad got from an Old Timer's game at Cooperstown. These are largely mementos of my formative baseball years, though there is a book of Red Sox matches dated 1965, back when box seats cost $3 and the phone number at Fenway was COpley 7-2525. The inside contains a complete list of that year's home schedule. There were a lot of day games and double headers and even something called a Twi-night double header. The Sox finished the season dismally in ninth position that year, though Yaz hit .312. Not much in the way of autographs, either. One that I cherish is from Rico Petrocelli wishing me a happy 35th birthday that came my way in 2003. There is also an All-Star Ballot from 1980, the only piece of paper I had available during BP when Yankee Jim Spencer was signing autographs. This is all pre-digital: they used punch cards back then. You could have voted for Bill Buckner at 1st base that year in confidence that Steve Garvey or Pete Rose would be on the bag come game time (it was Garvey). This was back when the National League owned the All-Star game, something they have not done for nearly a generation now. In 1980 Fred Lynn, Jim Rice and Pudge Fisk were chosen by the fans, but so was Bucky Dent. I was rooting for the Yankees that year, as I have previously confessed, and it was the last year our family saw a game at Yankee Stadium. These talismans live in a box of treasures at the bottom of an old green army trunk in my closet. There are many layers of my childhood and young adulthood here, from my kindergarten letter to Richard Nixon to the name tag I wore at the Bicentennial of the US Constitution as a descendant of its youngest Signer. These few bits of baseball ephemera, however, are of particular value to me as touchstones to my youth, and the thrill I always get walking up the ramp and seeing that great expanse of emerald grass dazzling beneath the stadium lights. The Carnival of Freedom is at Morning Globe. The Festival of the Trees (Halloween Edition) is at Windywillow. Blawg Review #132 is at Home Office Lawyer. History Carnival #58 is at Aardvarchaeology. And Curt Schilling is at Fenway for one more year. Now for Mike Lowell! update (11/7/2007) Jumped the gun (if not the shark) a wee bit in not waiting for the latest Tangled Bank at Paddy K , and later today Gary Smailes will host the next Military History Carnival. Ah, yes, and also the 87th Carnival of Satire. Good things, indeed. YES!!! Thank you, Red Sox! "The Red Sox in me is happy Joe Torre is no longer in charge in NY. The person in me wonders how does a guy who obviously has the respect and loyalty of his entire roster, a guy who’s taken his team to 12 straight post seasons, a guy who exudes class and respect, how does he, in the midst of what might have been his most challenging and defining season and post season, not only have to manage his team in a best of 5 win or go home series, but also answer a billion questions about being basically told ‘win or you’re out’? How did it come to that? ...Managers don’t win ballgames, players do, and I think you’d be surprised to know how bad we feel when managers we care about get fired because we know, if we have one ounce of integrity, that our failures as players are, most times, what gets a manager fired." With even Rudy Giuliani backing the Sox, can it be that there are some undercurrents of post-season respect passing between Gotham and Beantown? Lots more "B"'s observed in the Berkshires than normal, though the Manhattan-influenced Litchfield Hills are not especially bursting with Red Sox pride. I still have to get one of these, though. And I believe Schilling wears one himself.